History: (X-Force I#99 (fb) - BTS) - From its home in the Badlands dimension, the Demon Bear entity acted as a gateway between the Badlands and Earth. (New Mutants I#19) - After the Demon Bear entity gravely wounded the New Mutant Mirage, the other New Mutants engaged the Demon Bear in battle when it returned to keep surgeons from saving Mirage's life. During the battle, the Demon Bear cast a teleportation spell that transported the New Mutants into the Badlands, the Demon Bear's home realm, where the New Mutants saw the Demon Bear in all its glory with its captives, police officer Tom Corsi and nurse Sharon Friedlander. 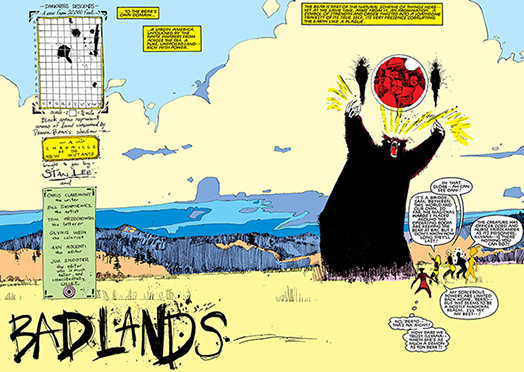 (New Mutants I#20) - Inside the Badlands realm, the New Mutants noticed the Demon Bear viewing Mirage from a mystic globe above its head surrounded by its prisoners. Before the New Mutants could attack, the Demon Bear transformed Sharon Friedlander and Tom Corsi into Native American forms and forced them to attack the New Mutants. As the Demon Bear swiped at the New Mutants, it briefly ripped a hole in space-time that was witnessed by Earth surgeon Bill. As the New Mutants continued to fight the Demon Bear to no avail, the Badlands realm expanded and with it grew the Demon Bear's power. Eventually, the New Mutants teamed together and defeated the Demon Bear, and with its defeat, they were returned to Earth. (X-Force I#99) - When the Demon Bear appeared on Earth again and terrorized San Francisco's Market Street, the mutants of X-Force (many members of which had formerly fought the Demon Bear as the New Mutants) battled the Demon Bear. During the fight, the Demon Bear swallowed Danielle Moonstar (formerly Mirage) and Arcadia Deville, transporting them to the Badlands realm. Inside the caves of the Badlands, Moonstar and Deville noticed their psychic connection seemed to be growing and Moonstar began picking up memories from Deville. The two were soon plagued with psychic manifestations of things they loved, in Moonstar's case, her winged horse Brightwind, and its Deville's case, her childhood doll Mary Weather. Mary Weather revealed that this seemingly new Demon Bear was actually a nightmare that was made flesh by Arcadia Deville's reality-warping powers and that the longer Moonstar and Deville remained trapped in the Badlands, the harder it would be to unmake the new Demon Bear. (X-Force I#100 (fb)) - Combining their powers, Danielle Moonstar and Arcadia Deville absorbed the power stolen from them to create the Demon Bear, dematerializing the Bear and effectively returning them to Earth. Comments: Created by Chris Claremont and Bill Sienkiewicz.